Cape Town - A rejuvenated Marouane Fellaini has said that after David Moyes disastrous reign at Old Trafford, Manchester United needed a "strict" manager. According to Teamtalk, Fellaini believes a Louis van Gaal-type manager was required to restore the English giants fortunes. With the Belgian midfielder's future in the balance upon the Dutchman's arrival, Fellaini revealed the new manager offered him a chance to prove himself. "He told me 'prove yourself and we'll see'. Now they are counting on me," he said. "There were never any real doubts. I was injured at the beginning of the season and then returned. The coach gave me confidence and I proved myself in a few matches. "After that, I was injured and I got sick again. For three weeks I was on antibiotics. It took a while, but now I can finally enjoy. "The coach is very strict, but that's good. We needed such a coach. Last season we had a bad season. We even missed European qualification. We needed a coach who would put some players' feet back on the ground. "If he says something, you should do it. Otherwise you'll fly out of it. If he has to take you off the pitch when the game hasn't been going on for more than 30 minutes he'll do it. Or during half-time. Fortunately, it hasn't happened to me yet." In recent weeks, Fellaini has been utilised with success in the number 10 role for Manchester United in the absence of Robin Van Persie and the waning fortunes of Colombian star Radamel Falcao. 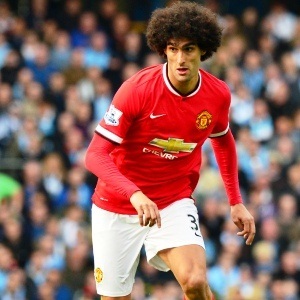 Fellaini has featured in the Red Devils lineup in their last five league outings, starting four of those fixtures.